If you’ve been dreaming about scoring that big catch, then trolling is the best way to make that dream a reality. It’s a different fishing technique learned by beginners and practiced by expert anglers to catch big game fish. 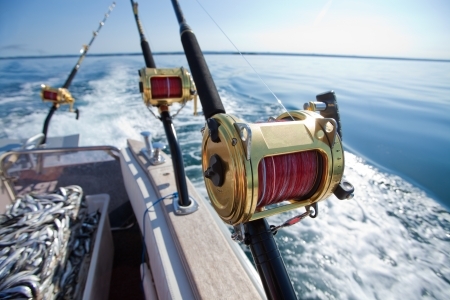 Here are a few tips that will have you trolling like a pro out on the water! Two very important and intricate elements in the trolling technique are controlling your lure depth and distance from the boat. When determining your setback distance, take into consideration the type of fish you’re targeting, the clarity of the water and the amount of other boats around you. When it comes to lure depth control, it might take some time to find the right level for your lure, however it will just take some time and a lot of patience. Not only will this help you determine your lure depth, but since you have multiple lines out in the water, your soon-to-be catch can choose the most favorable bait or lure in front of them. By taking note of the bait or lure that’s enticing your catches, you can switch up colors and bait sizes to find more success as you go. A key part of trolling is movement: that’s why the crew aboard the Triple Trouble will keep the charter moving, so the fish are chasing you, rather than the other way around. So, if you hook a fish, the last thing you should do is kick the boat in neutral. Not only will it snag your line, but also, you’ll be sure to lose your potential catch. Don’t worry, we won’t let that happen! Are you ready to test out this technique on your next fishing charter trip? Get out on the water with Captain Chad and the crew aboard the Triple Trouble! Call Capt. Chad at 256-431-5767 or email him today to book your trolling charter trip!